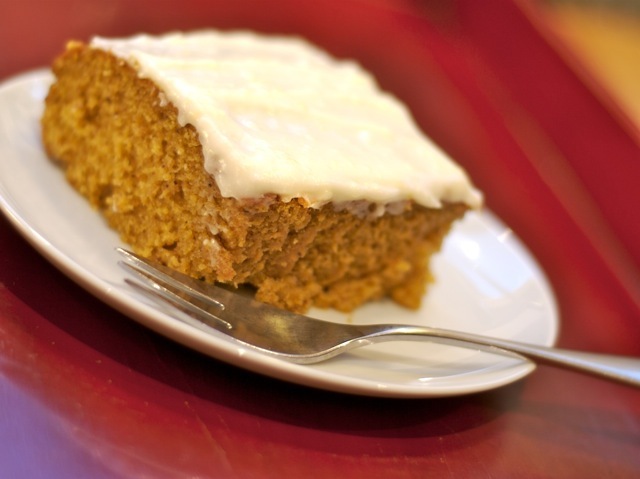 This cake is moist and delicious, enhanced by the orange-scented frosting. Preheat the oven to 350 degrees. Grease and flour a 13-by-9-inch baking pan. Make the cake: Beat the eggs lightly; beat in the oil, sugar, and pumpkin. In another bowl, stir together the flour, spices, salt, baking powder, and baking soda; gradually add this to the pumpkin mixture, blending thoroughly. Pour the batter into the prepared pan and bake for 40 minutes, rotating the pan in the oven after 20 minutes. The cake is done when the edges begin to pull away from the sides of the pan and the center springs back when lightly touched. Remove to a rack to cool; do not remove from the pan. Make the frosting: Beat the cream cheese and butter together until soft and fluffy. Beat in the milk, vanilla, and orange zest. Gradually sift in enough powdered sugar to make a spreadable icing; add additional milk by the half-teaspoon if necessary. Finish the cake: When the cake is completely cool, frost it evenly, then cut into squares to serve.